What Is The Best Winter Horse Riding Jacket On The Market? Riding in the winter can be really tough. There’s the frozen fingers, the rain dripping down your neck, toes as cold as blocks of ice – brrr! Having a really good winter riding jacket can make all the difference between falling off your horse like an icicle at the end of a ride, and leaping down with only the need to stamp your feet a bit. 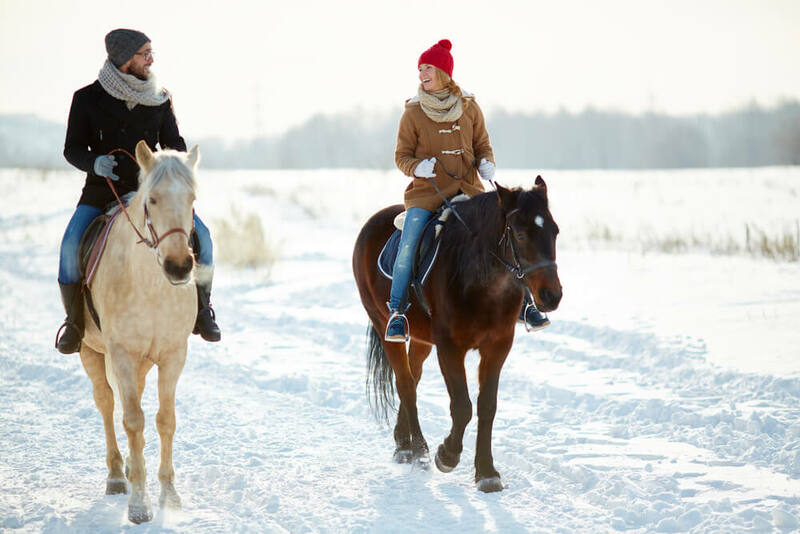 The best winter horse riding jacket warms your core, meaning that your extremities are fed by this warmed blood, which results in fewer chilblains and less of a chance of losing the sensation in your toes and fingers. There are a great many jackets out there that claim to be the best winter horse riding jacket, but it can be confusing to narrow them down to which one actually is the best one. This is a snazzy winter riding jacket, with all the features you would expect from a jacket that is designed to keep you warm, and more. It’s quite pricey, but worth the money when you consider the use you’ll get out of it. Lots (and lots) of pockets – Having many pockets is a great thing, especially when riding, as it means you don’t have to carry a bag. You can take a mobile phone, treats, a map, and just about anything else you need, and keep them safe and dry. Knitted lined collar and cuffs – Having extra warmth at places where heat escapes is important, as it can help keep as much body warmth in as possible. Full coverage hood – Having a good hood is a great feature, as it will completely cover your head and stop you getting irritating rain drips running down your neck. Waterproof against all but the strongest weather – A waterproof jacket is a must in the winter, because as we all know, riding in the rain is not much fun! Keeping your torso and your core dry and warm will go a long way to keeping you comfortable. It comes with a hefty price tag – This is about the only downside with this jacket – it will set you back. But look at it as an investment – it should last you for years! This is a high quality winter riding jacket, which is well made and designed to keep you as toasty as possible. A great winter riding jacket, designed to keep the cold out and the heat in. Made by a well-known brand, this is a jacket you can put your trust in. Machine washable for ease of use – No fancy dry cleaning for this jacket, you can just throw it in the washing machine when it needs a wash. This makes it a very practical bit of kit. Fully taped seams for longevity – Having taped seams not only means that the rain will stay out, but also that the jacket is less likely to wear at the seams and fall apart before you’ve had plenty of use out of it. Polyester lining and padding – Featuring a polyester lining for warmth and comfort, this jacket will keep you warm and dry and comfortable. Detachable hood – This makes it perfect for cold weather as well as wet – you don’t always want to have a hood attached, and the fact that this one is removable is a great bonus. Only comes in dark colours – Being seen on the roads is highly important while riding, and if you select this jacket bear in mind that you will need some high-vis, or something bright, over the top of it. 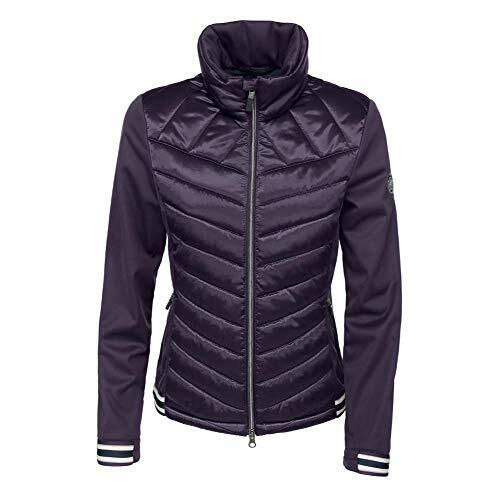 If you are looking for a great waterproof winter jacket, that is flattering to the female shape as well as being infinitely practical, this on is your answer. This is a softshell jacket, lightweight and water repellent. It should stand up to the rigours of the weather and keep you warm and toasty – and dry – on those long winter rides. Stand up collar – Having something that can stop the rain dribbling down your neck is a massive bonus. This jacket’s collar is high enough that it should protect your neck and shoulders from chilly drips. Wind resistant – As well as the rain, winter rides can be plagued by a chilly wind. This jacket will keep the worst of the chill off you, making the winter rides all that much more pleasurable. Contrast stripeband at hem and sleeves – Having something bright on a riding jacket, especially if you are riding on roads, is very important so that traffic can see you. The fact that this jacket’s dark colour is broken up is a great plus point. Inside zip pocket – Having a place that you can safely store important items like your mobile phone is a great feature of any jacket, especially on wet rides. Only comes in one colour – If you are looking to match your jacket to your riding colours you may be disappointed – unless your riding colour is grape! 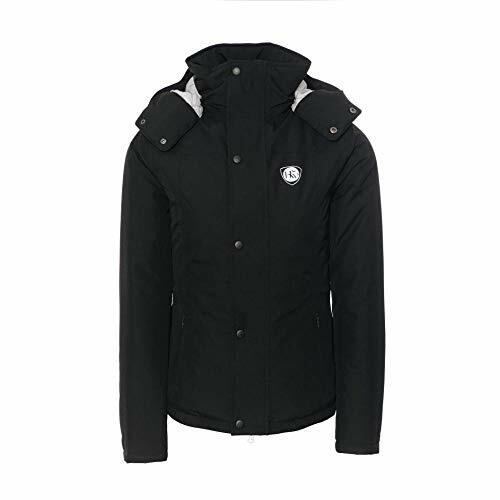 This is a great all round jacket, perfect for keeping you warm and keeping the worst of the weather off you. It won’t break the bank, and is functional and practical. There are so many things you shouldn’t forget when going on a ride, such as body protector, good riding boots or quality helmet; however, a good winter jacket is usually on top of my list too. Looking for the best winter riding jacket can be a bit tricky, when you start to search and realise the vast amount of choice that is out there. Now you can choose from the one that suits you best, knowing that only the best are selected! If you are after a really great jacket and you have a relatively high budget, splash out on the Ariat Women’s Veracity H2O Cold Series Waterproof Jacket. You won’t be disappointed. If you are after a practical, functional winter riding jacket then go for the Horseware Brianna Ladies’ Jacket, and if you want something that will keep the wind and rain off you, and you are happy with the softshell style then the Pikeur – Ladies Materialmix Jacket Calina is for you. I like all of these options about the same. Each of them is shorter, so they are not bunching up while you ride and they seem to offer plenty of protection from the elements. Riding horse is a year round activity, you might as well dress properly for all 4 seasons!